I own enough small fitness equipment to open my own gym, but most of it sits around unused. Not because I don’t work out, but because I’m a big believer in equipment-free exercises. There’s no denying the benefits of strength equipment, such as dumbbells and medicine balls, to enhance a workout and build strength, but the same benefits can be gained from an equipment-free workout. Each exercise description has a link to a short video of it, in case you'd like a demonstration. Almost all bodyweight exercises are built around “the big five.” These compound moves are foundational -- they’re effective on their own, but they can be added to or built upon to create challenging and interesting modifications. Even when exercises don’t strictly look like one of the big five, if you’ve learned to do them correctly, you can apply their body mechanics to practically any exercise. You’re probably familiar with the basic air squat. Just remember to start the move from hips, pressing them backward before you begin bending your knees to keep your weight in your heels and your knees aligned with (and behind) your toes. Doing squats is a functional movement that targets all the major muscle groups of the lower body: glutes, quads, hamstrings, and calves. Like squats, lunges are excellent for the lower-body, enhancing strength while also acting as a neuromotor exercise (an exercise that improves balance and coordination). Like squats, remember to keep your weight in your front heel as you bend your legs and lower your back knee toward the floor. 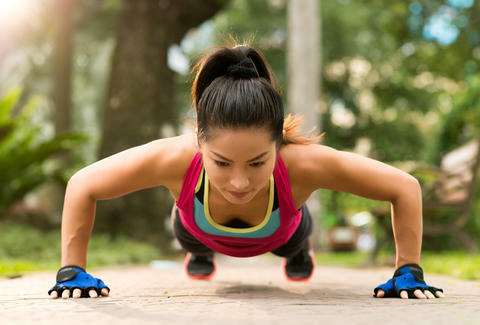 Push-ups are like the squats of the upper body -- they work practically everything. In fact, NASM-certified personal trainer Rachel McMichael says that pushups are hands down one of her favorite exercises because, “Not only do they work so many different muscles at the same time (shoulders, triceps, chest, core, and quads), they can be modified to any level. Modifications include wall push-ups, knee push-ups, triangle push-ups, incline push-ups, and so many more." While push-ups work the front half of your upper body, pull-ups work the back half -- your shoulders, lats, rhomboids and biceps. Technically they’re not equipment-free, as you do need access to some sort of bar, but you don’t need to buy anything. I performed modified pull-ups today at a park today by using a swing as my "bar." You don’t even need to be able to lift yourself off the ground. Simply grab a low bar with both hands, walk your legs under it until they’re extended and you’re "hanging" beneath the bar, then squeeze your shoulder blades together to pull your chest up to the bar, your feet never leaving the floor. Planks are a static exercise that, like push-ups, target the entire front half of your body, but are designed to build core strength as you hold a steady position for an extended period of time. Colleen Woods Dahlem, a certified trainer, has all her clients do them because, "They’re so simple -- they can be done anywhere, and work so much more than the core." When you’re ready to switch things up, these exercises offer the twist you’re looking for. They’re grounded in strength-focused mechanics, but they’re also total-body exercises that are practically guaranteed to raise your heart rate for a cardiovascular boost. The bear squat combines a squat and a plank with a dollop of low-impact power. If your quads don’t start to scream after 20 or 30 seconds, you’re a better person than I! Start in a high push-up position, palms under shoulders, body forming a straight line. Press your hips back, bend your knees, and extend your arms over your head without allowing your knees to touch down. Once you’re in this “plank squat,” press powerfully through the balls of your feet to extend your arms and return to the high pushup position. During a surrender, you move from a kneeling position to a standing position, then back to a kneeling position again, all while holding your arms above your head, as if you were surrendering. Rachael Novello, a certified personal trainer and fitness instructor, explains, “They really target those lower body muscles -- they’re perfect for exercisers of any level and can easily be modified if necessary. I’m currently doing them at 33 weeks pregnant and love them.“ Check out Rachael doing the move in action. Sure, everyone loves to hate burpees, but it’s tough to argue with an exercise that incorporates a squat, plank, pushup and an optional plyometric jump. You can modify them in about a million ways, but the basic move is as follows: From a standing position, squat down and place your palms on the ground under your shoulders. Hop or step your legs behind you to a full plank position. Perform a push-up (you can drop your knees to the ground if you’d like). Once you’ve done your push-up, hop or step your feet back to their starting position and return to standing. To really get your heart rate soaring, jump into the air, reaching your hands above your head. The dive-bomb push-up engages your upper body, core, and shoulders, and offers a fun way to incorporate flexibility into your strength routine by taking you from a yoga-like downward dog position to an upward dog position. Start in a high push-up and press your hips toward the sky to enter downward dog, your body forming an inverted "V." Bend your elbows outward and "dive bomb" toward the floor, keeping your hips up while your head moves lower. When your head is about to touch down, look forward and draw your chest through your arms as you lower your hips to extend your body. In a smooth motion, extend your elbows and lift your chest, entering an upward dog position. Laura Williams is an exercise physiologist and fitness writer who stopped writing this article to do a cat-cow because they just feel so good. Share your favorite equipment-free exercise on Twitter @girlsgonesporty.